Calling all foxy ladies and voodoo children to the casino floor. The Jimi Hendrix slot is here and boy is it a cracker. As you’d expect, Jimi’s music plays throughout and the visuals and all been inspired by the swinging ‘60s. There are a load of great bonus features to boot, so let’s take a closer look at this imaginative title from Netent. Loads of Hendrix tunes throughout. Plenty of exciting bonus features. For a slot based on one of the earliest proponents of LSD, it’s kind of disappointing visually. Some trippier animation wouldn’t go amiss. Jimi (“wild”) = 600x the line bet. Red Guitar = 400x the line bet. White Guitar = 200x the line bet. CND Sign = 150x the line bet. Heart = 125x the line bet. Record = 100x the line bet. Flower = 90x the line bet. Eye = 80x the line bet. One of the two features that can be activated during the main game is called the Purple Haze feature. It’s triggered when the Purple Haze symbol lands on reel one. When it does, all the low value symbols (A, K, Q, J, 10) transform into “wild” symbols for that spin. The Purple Haze symbol itself also acts as a “wild” after the transformation has occurred. 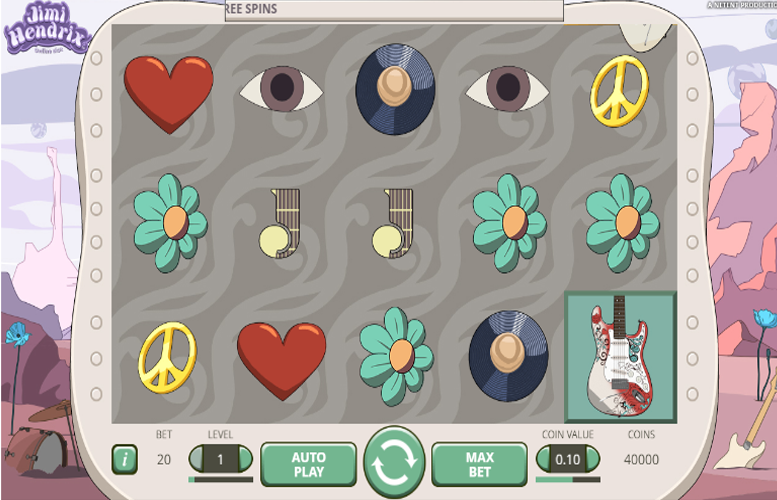 Landing four or more Red Guitar symbols on the reels during the main game will activate the Red Guitar Re-spin feature. After the Red Guitar Re-spin is activated, the reels will spin again once. If new Red Guitar symbols land on the reels during it, another re-spin is activated. The feature ends when there are no new Red Guitar symbols appearing on the reels. The Pick and Click feature is activated when three “scatter” symbols appear on the reels. These will land on reels three, four, and five only. There are four different prizes for the player in this bonus game: a coin win, Crosstown Traffic Free Spins, Purple Haze Free Spins, and Little Wing Free Spins. Players must click on the amplifiers to reveal one of four symbols. 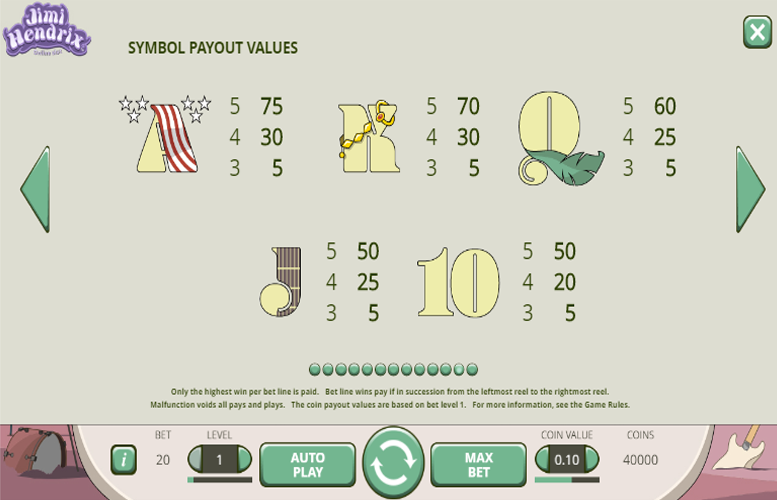 When the player has collected three of the same symbols, the corresponding prize is awarded. Players should note: Only one prize will be awarded per Pick and Click game. If the player collects three coin win symbols, an instant prize is awarded with a random multiplier of between 8x and 30x of the initial bet. If a player collects three Crosstown Traffic Free Spins symbols, six free games are awarded with “wild” reels appearing on different reels for every spin. On the first spin, the “wild” reel appears on reel five. On the second spin, the “wild” reels appear on reels four and five. During the third spin, the “wild” reels are reels three and four. On spin number four, reels two and three are “wild”. The fifth free game has “wild” reels on the first two reels. Finally, the last spin has a “wild” first reel. 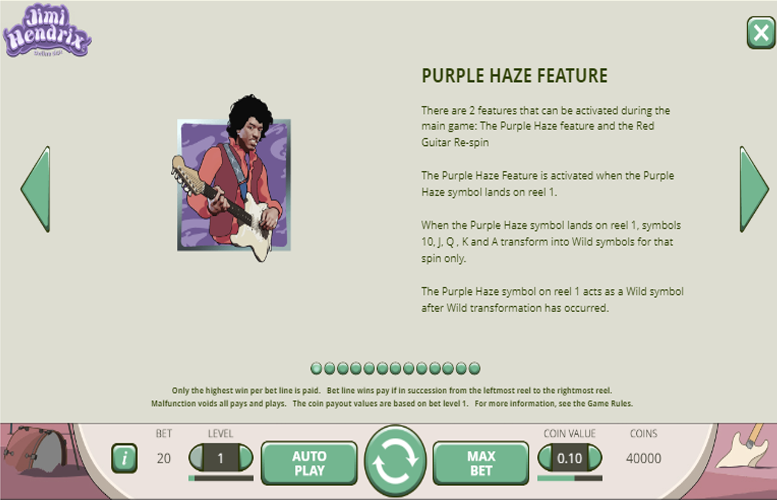 If the player collects three Purple Haze Free Spins symbols, between six and 12 Free Spins are awarded. 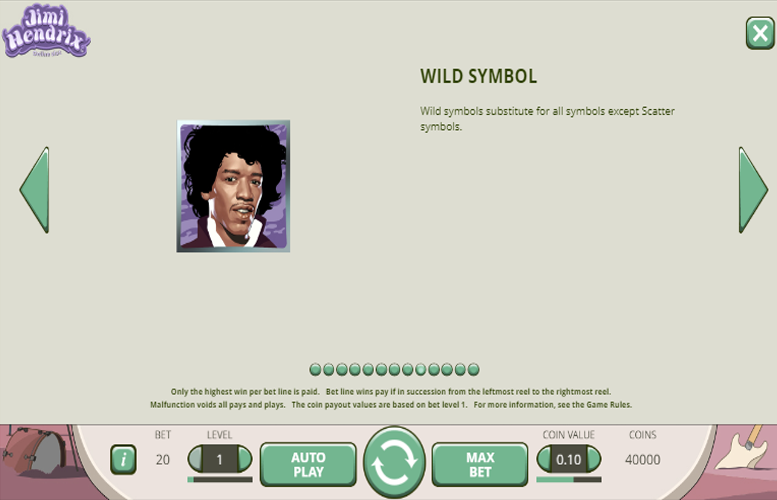 During these free Spins, the playing card symbols transform into “wilds”. If the player collects three Little Wing Free Spins symbols, they are awarded between six and 12 free spins. During these, between three and five overlay “wilds” appear randomly on the reels for each spin. Ace = 75x the line bet. The number of win lines is fixed at 20 on the Jimi Hendrix slot machine. This means that players are only able to adjust the value of every coin bet and how many are waged per win line. The minimum and maximum coin values are 1p and £1 respectively. 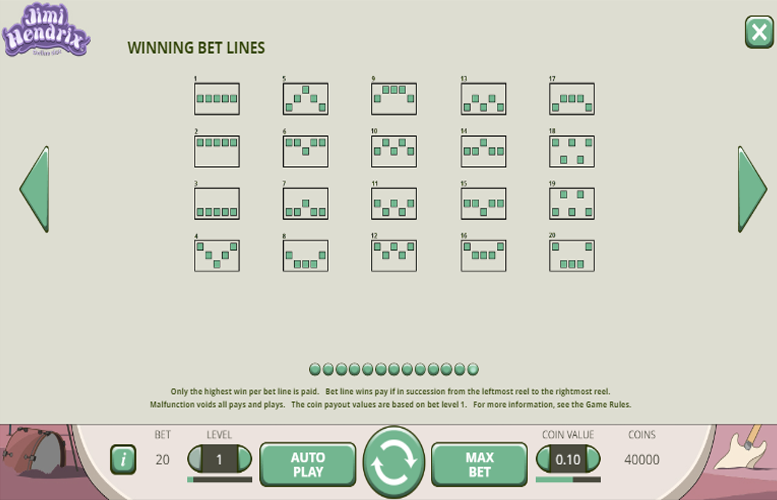 Meanwhile, players can choose between betting one coin per line and ten. With all values set to the lowest, the minimum bet per spin is just 20p. Conversely, with everything maxed out, the largest possible bet per spin is £200. The Jimi Hendrix slot machine is a great title. It features plenty of Jimi’s tunes which will certainly satisfy fans of the legend of rock music. The art style is also relevant with common images from the 1960s hippy movement used. What’s more, a wealth of special features will appeal to those who are less familiar with Hendrix’s material. One foible we did find with this title is the lack of imagination when it comes to imagery. We thought it could do with a splash more colour and perhaps some hallucinatory animations. This game has a rating of 4 / 5 with 297 total reviews by the users.